Before the sun came up Saturday morning, more than 60 riders and their horses were getting ready to trek 10, 30 or 50 miles through the forest for the Aspen Lake endurance ride. The ride is associated with the American Endurance Ride Conference. Organizer Diana Aldridge said a proper endurance ride is 100 miles, but 50 miles qualifies and 30 miles is a modified endurance ride. The 10-mile ride is just for fun. The ride started off on Clover Creek Road, about 10 miles outside of Keno. Riders didn’t seem to mind the early hours, and the horses were excited to go. Kelly Williams and Diamond Ruler L won the 45th annual Virginia City 100 on September 15, 2012, in a ride time of 14:29. It was their 3rd time to complete the ride, after finishing 17th in 2010, and 5th in 2011. Dennis Tracy and Brilliant Disquize tied with Shannon Constanti and TR Sierra Dawn for second and third, in a ride time of 15:13. "VC 100 is a wonderful ride. Equal to, or tougher than Tevis," Shannon said later. The challenging Virginia City 100 ride annually attracts some tough horses and riders. Gina Hall and 15-year-old Fire Mt Destiny finished the ride in 9th place. It was Destiny's 8th Virginia City Completion and his 17th 100-mile completion. He has 5640 miles, and 95 rides starts with only 1 pull. In his ride prior to the VC 100, he completed the Tevis Cup. "He's a phenomenal athlete!" Gina's daughter, Carolyn Meier, said. Gina has over 13,000 miles. This was her 13th VC100 completion. Connie Creech, a long-time supporter of the VC and NASTR (Nevada All-State Trail Riders, Inc) rides, finished in 20th place for her 21st VC100 completion. Connie is one of only 3 riders (the others being Phil Gardner and Al Beaupre) who have earned the 2000-mile Virginia City 100 Buckle. She rode LS Shardonney Bey +/, who has herself finished the ride 3 times. Connie has over 27,000 miles, Shardonney 3700 miles. It was Kevin Waters and 13-year-old DE Golden Ali's first attempt at the VC100. They finished in 12th place at 1:03 AM, a ride time of 16:47. "He has now down ALL the big ones: Bryce, Mt Carmel, Shellborne five-day rides. Tevis. Old Dominion. Big Horn. VC100. Some more than once!" Kevin said afterwards. "All while carrying not necessarily the most technically advanced rider in the world!!! Go Ali!!!!" Ali went over 5000 miles in the VC ride. He has 90 starts with only 2 pulls, and he's 12 for 12 in 100-mile rides. Kevin has over 23,000 miles. Goal accomplished! When I was 11 I wanted to be the youngest person to complete 20 times - yes 2000 miles over 20 years- the grueling and very rocky and hilly Virginia City 100 mile one day horse race! Golden Knight carried me to #20 just before midnight sept 15 2012 in 4th place. 3 for 3 top tens on this ride for him and his half sister Zoie! There were 43 starters, 28 finishers. BERLIN—"It was a blast, blast, blast," said Susie Reinheimer, of Bowdoin, Maine. "I've never been on a ride that was so well marked." Reinheimer and her husband, Dave, were recreational riders among the some 50 who took part in the 2012 Maynesboro Stud Memorial Ride Saturday, organized by Walter Nadeau of the Berlin/Coos County Historical Society and sponsored by many. The event marked 100 years since W.R. Brown of the Brown Company started the Maynesboro Stud to breed Arabian horses, known then and now for their intelligence and endurance. Reinheimer's remarks about the well-marked trail were echoed by others. 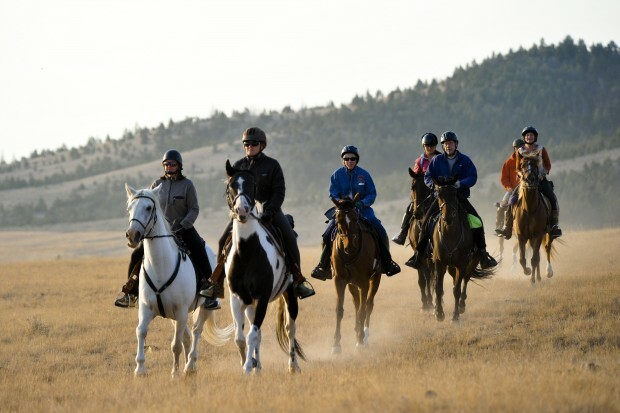 Some 13 signed up for the 50-mile endurance ride and 19 for the 25-mile endurance ride and nobody got lost—which is not all that unusual on endurance rides, according to some of the tales told by support crew as they waited for their horses and riders to finish. The competitors in the American Endurance Ride Conference-sanctioned event included some of the top riders in the northeast. Placing first in the 50 mile ride was a trio of expert women riders: Kathryn Downs, of Jefferson, Maine, riding her Arabian, Bey Gibby; Ruth Ferland, of Cornish, riding Jedidiah Blackguard, a half Arabian; and Sally White, of Marlboro, Vt., riding RSF Rusty, another half Arabian. At the last hold, the women agreed to come in together, said Downs, because while the trail was well marked, it was "rocky." "None of us can afford to trash a horse," she said. Before anyone knew of their decision, the race finish was moved up the trail and parked cars were removed from the road at the end of the trail, for fear the racing horses would overshoot the road in their headlong dash to and past the finish. But there was no headlong dash. The lead three riders finished at a slow pace, three abreast, holding hands—the rider in the center, Ferland, holding her reins in her teeth. A crucial point of endurance rides is the condition of the horse. "Holds" are scheduled along a course. During these holds of 30 or 40 minutes, timed from when the horse's pulse rate drops to 60, the horse is checked by a veterinarian who observes a trotting test as well as testing heart rate and respiration, and watered and fed. In the trotting test, if the horse exhibits signs of uneven gait or refuses, the owner must withdraw. "The horse is the athlete," remarked Downs at the first hold of Saturday's ride..."
The 2013 AERC National Championship will be held at Almo, Idaho, near City of Rocks National Reserve on September 20 (50 miles) and September 22 (100 miles). Rides will be held over varied terrain from 5300 to 8500 feet, traversing Bureau of Land Manageent (BLM) high sagebrush desert, City of Rocks National Reserve trails, City of Rocks State Park and alpine trails through aspen and fir forests in the Albion Mountains in the Sawtooth National Forest. Besides stunning views, competitors will share the trails with the historic past, riding over old emigrant trails and stage routes, past old stage stops, historic school houses and cemeteries, and older Native American sites. The town of Almo provides many amenities including restaurants, lodging, general stores and hot springs. City of Rocks offers some of the best rock climbing in the country, plus hiking and sight-seeing and fishing at nearby Independence Lakes. Ride managers Steph Teeter and Regina Rose will host the event. The various land agencies and community of Almo Idaho are all highly supportive of equestrian events and welcome the AERC National Championship to Idaho in 2013. Applications for the USEF Youth Sportsman Award are available online at the USEF Youth Sportsman Page. The application and all supporting materials must be received by the AERC office by October 1, 2012. The USFS has been working on a long range management plan for the trail system in the northern half of the Cumberland District of the Daniel Boone National Forest in Kentucky for going on five years. On August 31 they revealed their alternatives and began a 30 day comment period. This may be our last chance to influence the final outcome. This is the USFS and comments may be submitted. by ANY US Citizen. Currently, this area has over 110 miles of trails and gravel roads open to horse use and at least 80% of trail users in the area are equestrians. The AERC National Championship has been held on these trails twice in the last ten years. Once you get the FS web page: look on the left side and find "Land & Resource Management". Go down and Click on "Projects". A list will appear. Go down to the sub-heading "Under Analysis". Click on "Cave Run Non-motorized Trails Initiative". There is a ton of stuff here but what you need is under "Analysis". There you should find 7 maps and some narratives about the project. The FS "Alternatives" range from No Change (very unlikely) to reducing equine use to 19 miles (2 of the 5 alternatives) in the winter (months not specified but possibly six months of the year) and reducing equine trails by one third or more during the dryer months. The trails taken from equine users would be given to the approximately 15% of users who ride mountain bikes. Although the claim is made that the seasonal closures are to protect trails from excessive wear in wet weather, no science was applied to choosing which trails to close and no flexibility is provided. Any reduction in trails available for equine use will result in greater impacts on the remaining trails, as well as a dramatically different experience. Issues ignored or summarily dismissed by the USFS in the process (though brought up by equestrians) include; the Congressional mandate to the FS to foster local economic development, the fact that the vast majority of trail users are equestrians, the historical and cultural significance of local equine use, the fact that equine use is the ONLY predominately female activity in the forest while mountain bikers are the same 20 to 40 year old male group that makes up the majority of user groups in all other forest activities, equestrians also are older than any other user group, horse riding is the best means of access to back country for people with physical limitations, a reduction in bicycle use in the area since the only mountain bike shop in the area closed last year and Equestrians have a long history of cooperation and working with the USFS to improve trails while Mountain Bikers have openly flaunted regulations and even assaulted other users in an attempt to intimidate them into abandoning the trails. There is room for compromise and we are not insisting on no changes, but the final plan must be reasonable! Please send Comments calling for NO reduction in the total miles of equine trails. These Comments will play a role in the selection of the preferred alternative. Comments MUST be received by Friday September 28. Written comments, or comments provided in person, must be submitted to Frank Beum, Forest Supervisor, 1700 Bypass Road, Winchester, KY 40391. Comments can be sent by facsimile to 859-737-3867. Electronic comments should be in a common digital format and sent to comments-southern-daniel-boone@fs.fed.us. The office business hours for those submitting hand-delivered comments are 8:00 a.m. to 4:30 p.m. Monday through Friday, excluding holidays. Oral comments via telephone must be provided during normal business hours to Becky Riegle, Project Leader at 989-724-9381. Click below for the AERC Scholarship Application which is due to AERC VP Jan Stevens by 1/1/13. AERC members from high school seniors through age 21 (must be younger than 22 on 1/1/13) are eligible to apply. Please see application info sheet for other requirements. The winner of the $1000 scholarship will be announced at the 2013 convention's national awards banquet. National Public Lands Day (NPLD) is the nation's largest, single-day volunteer event for public lands. In 2012, NPLD will be held on Saturday, Sept. 29, 2012. National Public Lands Day (NPLD) is the nation's largest, single-day volunteer event for public lands. In 2012, NPLD will be held on Saturday, Sept. 29, 2012. NPLD began in 1994 with three sites and 700 volunteers. It proved to be a huge success and NPLD became a yearly tradition, typically held on the last Saturday in September. Since the first NPLD, the event has grown by leaps and bounds. Eight federal agencies as well as nonprofit organizations and state, regional and local governments participate in the annual day of caring for public lands. National Public Lands Day keeps the promise of the Civilian Conservation Corps, the "tree army" that worked from 1933-1942 to preserve and protect America's natural heritage. Why is National Public Lands Day Important? 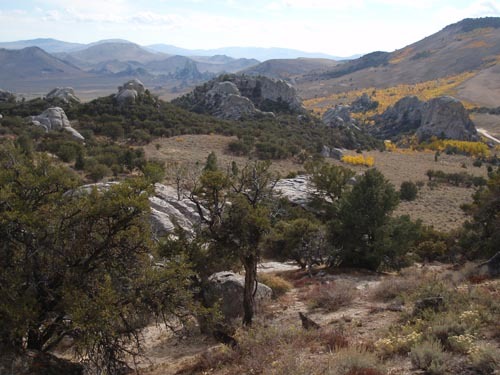 NPLD improves public lands for outdoor recreation, with volunteers assisting land managers in hands-on work. Interested in National Public Lands Day? To volunteer, view our Find a Site map here. Her alarm buzzes and she’s back outside in the dark, strapping on a saddle. The horizon is burning red and her horse snorts in anticipation for the ride to come. She’s preparing for the seventh annual Pioneer Cabin Endurance Race, which is a two-day event on the Dagnell Ranch off Lincoln Road. She is one of several locals competing in the endurance race, which draws people from around the state and as far away as Calgary. On Saturday, 12 racers competed in the 50-mile endurance race, 16 in the 25-mile limited race and two in the fun ride. On Sunday, three competed in the 50-mile endurance race and seven competed in the 30-mile limited distance race — this is the race Muscutt was preparing for. As the sun beams across the wide Canyon Creek valley, the 50-mile riders let their reins down and head off across the dry landscape, kicking up dust streaked by rays of light. The 50-mile course is composed of two 15-mile laps, one 12-mile lap and one 8-mile lap. After each lap, the riders and their horses take a 45-minute break while veterinarians check the horses’ vitals, such as cardiovascular, skin tenting and gut sounds. BERLIN – The Maynesboro Stud Memorial Ride will draw over 50 horses and riders to Berlin this weekend for an event that has captured the attention of the Arabian horse world. The event celebrates the 100th anniversary of the founding of the Maynesboro Stud by William Robinson Brown. Brown, a member of the family that founded and operated the Brown Company paper mill, is considered the most important breeder of Arabian horses in the United States between 1912 and 1933. Attending the festivities will be about a dozen Brown descendants including his daughter and son, Nancy Lee Snow and Fielding Brown, according to Walter Nadeau of the Berlin and Coos County Historical Society. The society has been working for over a year to plan and organize the event. The highlight of the event is the 50-mile endurance race on Saturday. The race will start and finish at the Brown Company barns on the East Milan Road where Brown raised his horses. There will also be a 25-mile limited distance race and a 13-mile recreational ride. Nadeau said riders are coming from across New England as well as New York, New Jersey, and North Carolina to compete here. For a substantial chunk of his business career, Barry Waitte “played with the big boys” in the worlds of high technology and venture capital. When he wasn’t moving money around or investigating a tech breakthrough, Waitte and his fianceé — now wife — Jennifer, spent days on the backs of Arabian horses, taking part in single day endurance races that stretched for either 50 or 100 miles. But the lure of the grapevine got to Waitte, and he decided he’d rather grow grapes than pound stakes in high finance. Not only was he familiar with Napa Valley but he felt Napa was the best place to make the type of wine he likes to drink. 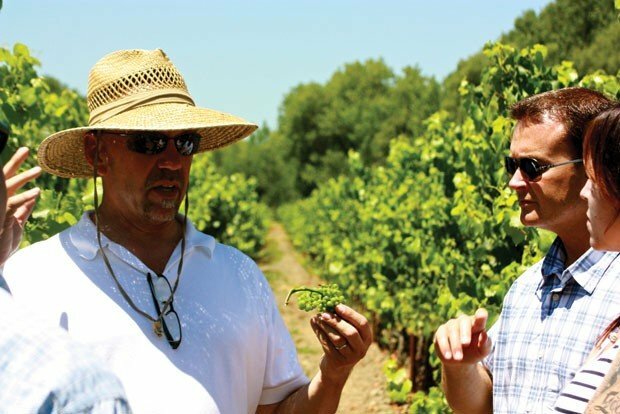 “My parents used to vacation in St. Helena ... I’ve been coming here since I was 2 years old,” he recalled over a glass of a lush merlot enjoyed on the veranda of his Yountville wine estate. "He was going to shoot the horse!" We all hear horror stories about horses that get into the wrong situation, with the wrong owners or are asked to compete in the wrong discipline. Many times these horses are one connection or one circumstance away from excellence and a chance to thrive in life. It's a common story in the life of a horse and many times they don't end well. But when the stars align and a horse finds his place magic can happen. The Fury changed hands as a three year old for $100.00 and the sale possibly saved him from a bullet. The $100.00 purchase not only changed his life but started a chain of events that would give him the opportunity to win the most prestigious 100 mile horse event in the world. In late 2009 I started looking for a new endurance horse. I had taken several years away from the from the sport of long distance racing and was looking for the right horse to help introduce several exciting EasyCare hoof boots. I wanted a horse with presence, with attitude, a horse that loved his job and a horse that people would remember. The horse in many ways would end up being associated with the barefoot movement, the Easyboot Glove and Easyboots in general. Last month, I became John Wayne for the day. Or that’s how I felt. Dressed in double denim, with spurs on my cowboy boots and leather chaps slung over my jeans, I was clutching a hand-stitched saddle on a horse called Hamburger. Vast, weather-beaten plains stretched out in front of me. I was in Big Bend National Park in Texas, riding and filming with real-life cowboys – and yes, we were wearing Stetsons – as they herded cattle across the desert. Creature comforts were sparse. When our horses began to gallop, sand lifted in great clouds. It felt like being in a hairdryer – not surprising when it was 110F (43C) in the shade. And then there were the rattlesnakes. Knowing that they could spook the horses at any moment as we wended our way through some of the wildest, most isolated country in the Lone Star State was just a little bit scary. Welcome to the life of a proper cowboy; men who work the land all year – rounding up longhorn cattle, often for days at a time. After a long stay in a San Francisco rehabilitation center, Crystal Costa, a downed horse rider, has made it home. Last Saturday, Costa, 50, came in through the decorated gates of her ranch in Cool. Handmade banners by Costa's son and neighbor reading "Welcome Home, Crystal" still hang a week later. Costa is now a paraplegic after she suffered a broken back after an equestrian accident in June. "Even though I know how sad it is I can't let it do that to me. I have to make the most of it and make it work," Costa said. The accident happened while Costa, who has ridden horses for 40 years, was training to ride in the Tevis Cup near Francisco's checkpoint. The Tahoe-Sierra 100-Mile Mountain Bike Race was happening at the time, but Costa didn't know that. "Always find out if there is a bike race on the narrow trails and on trails where you'd never think there would be bike," Costa said. "Riding horses, riding bikes, hiking out on the multiuse trails, it's a gamble." Jon Hyatt, of Granite Bay, was around mile 85 into the Tahoe-Sierra 100 when he noticed three horseback riders ahead, one of them being Costa. Hyatt, who was in fifth place at the time, acknowledged the three riders and proceeded to go around a green gate and past them. As Hyatt maneuvered around the gate, his bike tire slid in loose gravel and one of his shoes came unclipped from his bike peddle. The racket from the loose gravel and the unclipped shoe startled Costa's horse, along with one of its protective boots coming undone. 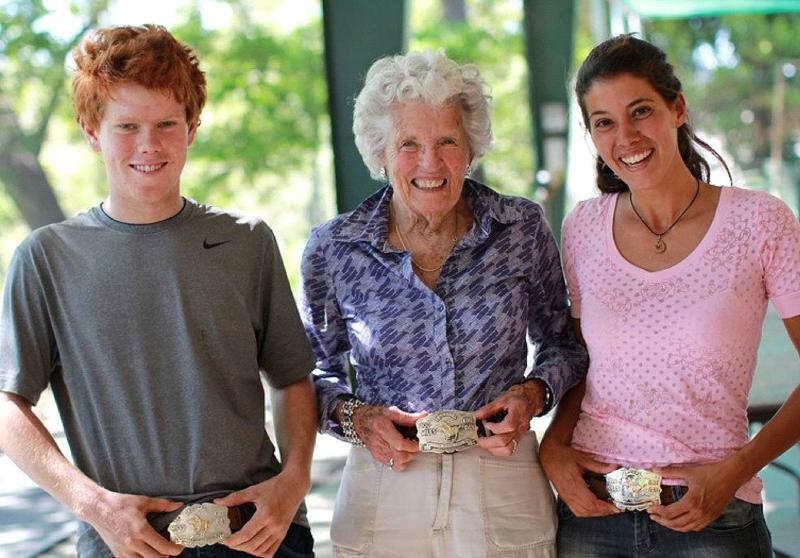 Instituted in 2012, the Tevis Legacy Buckle Program allows first time finishers to receive, at no charge, a buckle donated by a previous Tevis Cup Ride finisher. The buckles collected by the program this year were from rides as early as the 1960's and from rides as recent as 2011, thanks to the generosity of many donors. At the awards banquet on August 5th, 42 Legacy Buckles were awarded to first time finishers. The photo shows donor Julie Suhr with first time finishers John Donley, a junior rider, and Miriam Rezine. Plans are in place to award Legacy Buckles in 2013. Anyone who would like to donate past buckles is encouraged to do so. Please contact the WSTF office for additional information. A 15-year-old gelding with a history of overcoming debilitating injuries chalked up his latest comeback this month as he and his 67-year-old local rider completed a grueling, 24-hour endurance ride through the Sierra Nevada. KHnight to Remember (Remy for short) and Dr. Peter Claydon placed 14th in the 100-mile Tevis Cup trail ride, which was finished by only 98 of the 204 horse and rider teams that began it Aug. 4. “Remy is an amazing horse, and I am grateful to have such a wonderful partner,” Claydon said. The ride starts at 5:15 a.m. at Robie Park, near Lake Tahoe, and takes 24 hours to complete the 100 miles on unlit, switchback trails, climbing to nearly 9,000 feet at Watson Monument, with sheer drops on one side, over a swinging bridge and down into river beds before it ends in Auburn, Calif. The Tevis Cup, which has been held annually since 1955, is widely considered the most difficult equestrian endurance ride in the country. Remy was born and raised in the Santa Ynez Valley and came to Claydon from Ryding Hy Arabians as a totally untrained 5-year-old. They began their endurance-racing careers together and have finished in the top 10 more than 40 times, including 11 wins.